Some of you are very astute, seeing the similarities in our recent family reunion to the essence and aura found in the work of May's feature author/artist Patricia Polacco. Louise said it was "like stepping into one of Patricia Polacco's books." And that (in a nutshell) is what is so beautiful about Patricia Polacco's books and why readers have fallen in love with her work time and time again. She writes about family...namely her family but the stories sing with the natural seasons and rhythms that happen in all families. 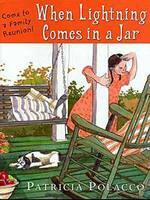 The book pictured here When Lightning Comes in a Jar is one of my family's Polacco favorites. At least it is mine. 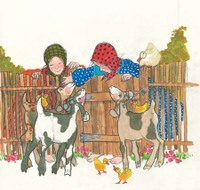 It's one Polacco book that I pull out every summer to read to the children right before our annual family reunion. I'm sure my photos reveal my love for this Polacco book and some of you recognized this. 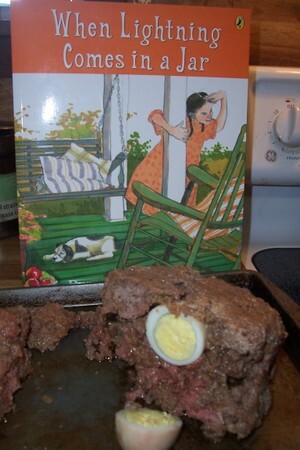 And so I hid a hard-boiled egg in the middle of today's meatloaf and, of course, one of my children who is not as sentimental as I am just had to make the statement: "Oh, Mom! you didn't!" Well, yes! I did. And, yes, I needed to. It was the sauce that topped our month-long bonanza of enjoying Polacco's books. 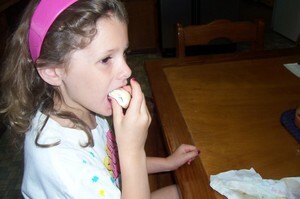 Another child was happy to eat the egg. For Polacco's books are like little jars lined-up on our pantry shelves. They are full of good stuff. "eat scruptious Jell-O and meatloaf"? "scrawl new measurements" of growing cousins on doorjambs? remember members who "gave (their) life for (their) country in a war far away"? laugh and cry over stories? catch fireflies in jars at the end of the day? And, then "when the sun is low and the shadows long" do you "sit and fan (y)ourselves in the shade of the maple trees?" with "a new crop of children...gathered at (y)our knees" without "father, grandmother, aunts and uncles...no longer here" and "tell their stories and bring them back for fleeting moments."? Polacco's books are treasures that show us how to capture those stories, those recipes, those stars, and the lightning and store them in jars for future generations. Before we move on to our new featured author, I'd like you to encourage your children to write and illustrate (using the example they've seen and read in Patricia Polacco's books) their own family story. 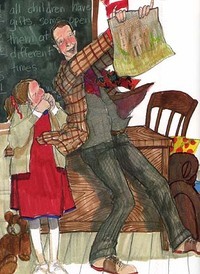 It can be about someone's birthday party, a family reunion, a fishing trip, an heriloom quilt, a grandmother who helped you bake a cake, or a rotten red (or black or blonde or brown)-headed older brother who perhaps isn't so bad afterall. Look through a family photo album and encourage your child to pick an event and write and illustrate their own story. If your child has difficulty with this sharing or gets discouraged as some children do over writing assignments, offer to write the story while they narrate it to you. Then have them illustrate it. This is one really cool way to capture that "lightning in a jar" and store it forever on your family's shelf of memories. Store their story in their Author Fiesta binder. In this way your children will have "full bellies, tired bones and flickering jars in their laps. Their hearts will be overflowing. Full of lighning, put there by folks who loved them even before they were born." Here are copywork sheets to print and insert in your child's library binder. If you have not read these books yet, don't worry. When you come across them, pull the binder out and the copywork will be ready for your child to copy. Many schools are finishing up their lesson plans this week. Many schools are shutting their doors for the summer break. Air conditioners are kicking on in many homes across the country. 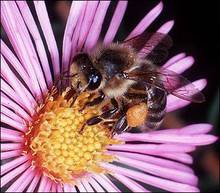 The sun is beaming on flower gardens, vegetable gardens and herb gardens. Children are being sent to grandma's house and day cares and camps across the country. But you, dear readers, have another week to relax with your children and visit the world of picnics, family reunions, general stores, a fancy hotel in Memphis, and a family farm in Michigan. You, dear readers, still have time to enjoy another week in Gramma's backyard catching fireflies, painting Pysanky eggs around the table, and boat riding for an adventure. 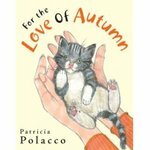 Patricia Polacco has given us this rich and beautiful world. Enjoy it with your children. 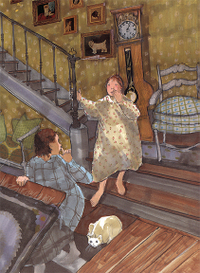 Click here to listen to Patricia Polacco tell your child(ren) about her book Welcome Comfort. Click here to watch Patricia Polacco draw and talk about Betty Doll. Print this sheet and have your child do it for copywork today, then insert it in his/her Author Fiesta notebook. Does your child have his binder yet? http://www.storylineonline.net/. The book is read by Melissa Gilbert. It is a fun way for children to enjoy the book." Thank you for letting us know about this valuable site, Michelle! To find the book just click on the arrow that reads "More Stories". I also see that Thank You, Mr. Falker is available as well. I have used this book as a demonstration in literature talks. You will not want to miss reading it with your child. "I found this resource at our library: Patricia Polacco did a film called "Dream Keeper" where she explains what she does, why and how ... it's only 23 minutes long but is a great addition to a study of this amazing author/artist. Seems she also wrote an autobiography with the same title ...."
In preparation of the May Author Fiesta study, you may print out this booklist and take it to the library with you. Find as many books by this author as you can, check them out, and bring them home. My children and I have, in the past, really enjoyed the "Meet the Author" series. These books will serve as a perfect invitation for your child's visit with the famous Author Fiesta personalities. See if your library has this book: Firetalking by Patricia Polacco. Congratulations to Joann and Maria for guessing correctly. Your guesses were all terrific. Be sure to try again next month. Now, are you and your children ready for a fiesta featuring the art and language of Patricia Polacco?